Two men were recently arrested after police say they stole hundreds of items from dozens of homes around Lawrence over the past several months. 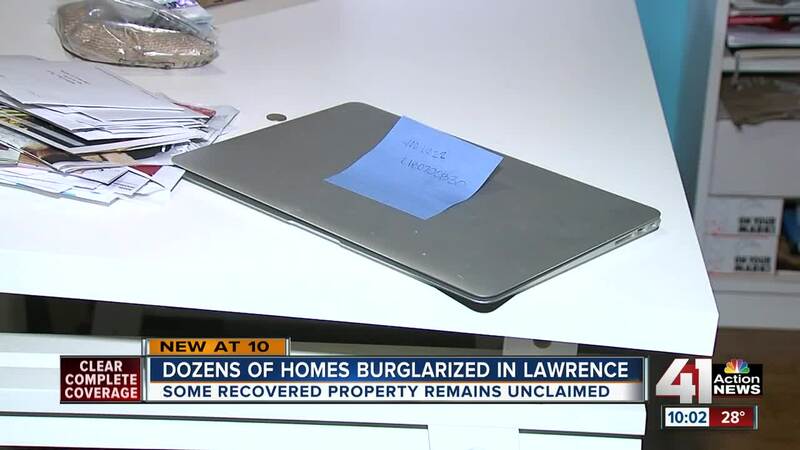 LAWRENCE, Kan. — Police recently arrested two men believed to be connected to dozens of home burglaries in the city that led to hundreds of items being stolen. According to investigators, the burglaries started last March and continued through the year. Two men now find themselves behind bars in the case, including 33-year-old Brian Farrar. Farrar faces multiple charges in the investigation while the second suspect has charges pending against him. Both men have a history of crime and have been charged with multiple other burglaries in the past. Kellee Pratt, who lives in Lawrence, was one the victims who was recently hit in the crime spree. Pratt believes the suspects broke into her home by going through her garage. After entering her home, Pratt said she saw signs of a quick exit by the men, including a crowbar that was left in her husband’s office. Pratt told 41 Action News that multiple items were stolen from inside her home, including jewelry and an old Irish cup that has belonged to her family for decades. Following the arrests, police were able to retrieve hundreds of stolen items. Over the past few days, victims have been able to visit the police station to go through the collection to see what belongs to them. Pratt said she was able to retrieve her laptop but documents and records on the device were erased. The Irish family cup and several other items, however, still remain missing. “Right now, I don’t know. Do I go to pawn shops? Do I go to eBay?” she said. With the two men now behind bars, Pratt hoped justice would come soon in the case. While charges are still pending against the second suspect, Farrar is expected to be back in court for the case on Dec. 12.